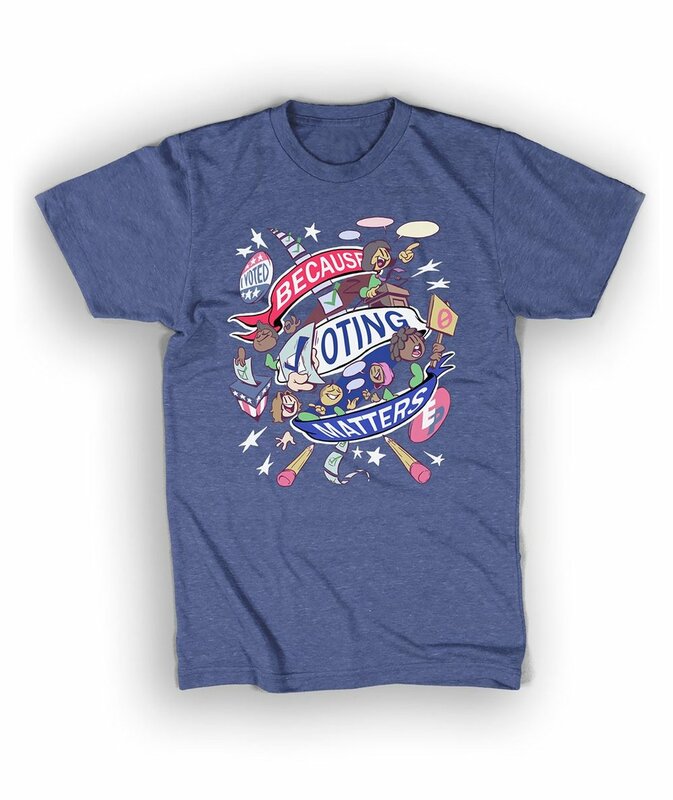 New Extra Politics Shirt: Because Voting Matters! Check out the shirt here! To this day, voting in elections--local, state, and national--is still one of the most powerful, effective ways YOU can make change happen. This shirt can be your year-round badge of honor for participating in our political system even after your "I Voted" sticker from the polls disappears in the wash. Design by artist Joe Maslov! The first pre-order period starts now, and the initial batch will be ordered on 10/23. The shirt will still be available to purchase after this period, but any orders made during the shirt’s first week on the store will be shipped out soonest. We are also giving away 6 shirts to folks on Twitter who cast their ballot in the upcoming November 6 U.S. midterms! If you take a photo of your ‘I voted’ sticker from the polls, or with the envelope of your mail-in ballot, mention us @ExtraCreditz and include the hashtag #BecauseVotingMatters. Winners will be randomly selected on November 8 and contacted on Twitter to confirm shirt size and shipping address (please visit DFTBA’s site if you have questions about shipping addresses). If you’re curious about whether or not it’s OK to take and share a picture of your actual ballot, that varies a lot from state to state. We don’t need to see a picture of your ballot though! In this video we do a quick recap of our recent episodes and news since PAX, and we also talk about upcoming news for the rest of the year. Notably, Extra Sci Fi is on break now and will be back end of December/beginning of January, and our next Extra History series will be on the Viking Expansion thanks to the patrons who selected that topic. Extra Mythology is relaunched as a recurring series! Mythology is the foundation of the world. Every civilization and culture has its own myths--legends of celebrities and heroic acts--that define them. Mythology is a fundamental ingredient to understanding world history and it subsequent influence on art, religion, literature, economies, and more. Mythology is the lore of the human experience--we use these stories to define our moral values and our place in the universe. To that end and purpose, Extra Mythology will now be a recurring show on the Extra Credits YouTube channel, airing on biweekly Mondays starting October 8, 2018. Eventually we would love to have this be a weekly show just like our other “extra” shows, but to do that we need to be able to hire a second artist and dedicated writer. We plan to accomplish this through the Extra Mythology Patreon community, where members can also get early access to episodes before they air, and help us decide what myths we should cover in future episodes!